With CtC out we will draw our coverage to a close now. Thanks for joining us - we’ll be back next week for CtC’s fixture against London Fields. CtCCCC crash out… they fail to chase the runs by some margin… hope of winning the tournament have evaporated and they have only won a single match. What a shambles. CtC getting desperate here. Davo to bowl the final over and they need wickets… this is an extraordinary field… every man is ‘catching’, but not in a slip cordon, every single fielder is over to the leg side to try and take a catch. And it’s working, that’s two in two from Davo! Hat trick ball! The team slope off to the pavilion and tuck into a round of baguettes and filling. Hammo has an accident with egg Sandwich and complains it is somewhat “sloppy”. The tea lady is offended and Hannah Dillon has to wedge into some serious diplomacy. This is vintage Hammo. Change of innings… Entrecasteaux 77-1 from their 6. Davidson earns promotion to open alongside Hammo. CtC will surely need the ginger genius to fire here. Davidson hits opposition big show Brad bang in front and launches into a huge appeal… not out. Davo cannot believe it, he’s halfway down the track double tea-potting the umpire. Entrecasteaux won their first match too and this looks to be a crucial match not just in group B, but for the whole tournament. Dean wins the toss and asks Entrecasteaux to have a bat on the main pitch. And that’s lunch… Gimmers calls for an early lunch… but wait he’s gone early and gets shouted down. That is not, lunch. Win for CtC - that’s a crushing victory for the cricketing cyclists. Beer and Bacon fail to hit a boundary all innings and can only manage 27-3 from their six overs. Two wickets for Dean and strong bowling all round. Innings over at 79-1 - what a partnership from Gimson and Davidson. This looks a good score on a tough pitch. 6! It’s reigning sixes as Gimson finds the fences! CtC are stuck in on the notoriously tricky football pitch wicket… and Hammo goes first ball! It simply doesn’t bounce. Davidson joins Gimson at the wicket and they start to rebuild. Rupert and Hannah arrive. First time CtC have had a dedicated supporter on tour, great to see. The team arrive into the centre of Entrecasteaux and wedge into a cafe. It’s a round of pastries, cafe au lait and petit biere to kick off the day. Charming! Morning everyone and welcome to day two of CtCCCC’s tour of Provence, and it’s no surprise who is first up here, Simon is off to the pool for a couple of lengths. Rudders is keeping an eye, but he’s not committing. That’s all for tonight folks, the team are wedged in to the accommodation getting stuck into some beers and oven pizza, in his sometime cousin’s absence it looks like Davo is stepping up to Chef duties. 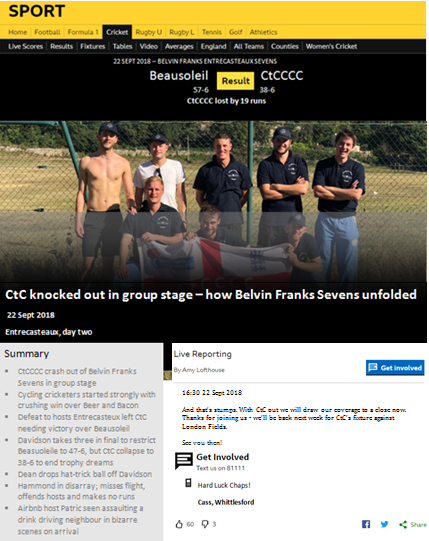 I’ll be back in the morning as the cycling cricketers begin their attempt at capturing the Belvin Franks Entrecasteaux Sevens trophy. Catch you then. Drama as the bus pulls at last onto the correct road for the airbnb, the host is out on the street, and he’s dragging a boy from the car, wait what’s this? It’s the same lad the boys were asking directions from outside the bar about an hour ago, and he’s got behind the wheel absolutely leathered! The airbnb host drags him from the car and shoves him to the floor, but the young lads parent arrives just as it looks like it might turn nasty. What a strange sequence of events. Could this be an omen for tomorrow? Hammo finally catches up with the group and they’re off to Entrecasteaux. Probably not much to report on for a while so I’ll nip out and get a brew. Dean and Davidson arrive at supermarket. Dean begins reverse park outside small supermarket. Dean and Davidson drive off in their new wheels, whilst Gimson leads the charge to the bar with the rest. Hammo is in air. Dean and Davidson get to the car rental desk and formulate a plan. No surprise here, Dean is calling a supermarket run. Tour baggo Fairbank leaves Dean’s suitcase on the carousel. Disapointing from a man who only six months ago was tour judge. Wave one land to news of their star batsmen being only an hour and half behind them. Happy days. Dean is straight into admin mode regardless. He leaves the bags on the carousel and charges straight to car rental. Hammo is turned down from the 17:50 to Marseille, but he manages to get a flight at 18:25 to Nice. That’s a great result for the ginger genius. So six lads make the ‘plane and they’re looking forward to a round of over-priced Heineken’s on route to Nice. Hammo is however stuck the wrong side of security and engaged in negotiations with Easyjet about a later flight. Six tourists at the gate, but still no sign of Hammond. Davidson is getting agitated. Unbelievable scenes. Shaw and Rudkin cruise through duty free. All too easy for Gimmers, he’s ordering a pint from Fairbank. Shaw and Hamo are flying, they have flown past Hammo and should be at the airport in 10. Suddenly they’re odds on to make this flight. Gimson is in, he pulls up at the south terminal. Dean and Davidson order a plate of cheese and biccies from the BA first lounge. Though their smugness is momentarily broken as they start to worry if the Director of Cricket’s knee injury will survive the forthcoming weaving required to dash through security. Dean and Davidson are now wedged into the BA first class lounge in Heathrow plotting alternative methods of getting the team on tour. Davidson’s PJ seems to be busy, so it’s the 17:50 Easyjet flight to Marseille that becomes plan B.
It’s all going on here. Hammo is now closer to Gatwick than Shaw and Rudkin, but surely his Uber will get overtaken now their train is on the charge. This is like an episode of Top Gear meets Border Force. Rudkin and Shaw decide to stick with the train, unsurprisingly Rudders is feeling gloomy. Rudkin and Shaw now on the move but still North of East Croydon, do they stay on the train or are they going to sit it out on the train. Could be a big call to make. Gimson’s train (makes me think, anyone else think Nat could make a good train driver? Any other jobs for the CtC lads text in on 660444) has found a station and so he wedges into an Uber alongside some randoms. He should be fine. Rudkin and Shaw disconcertingly quiet. Things looking increasingly desperate here. Rudkin is in disconsolate mood. Hammo off the train but he’s struggling to get an Uber and he’s around an hour from Gatwick. Looks a long shot for him. Rogue. Drives’ in Gimmers train slams it into reverse and heads back towards London, looks like they are targeting a Redhill disembark. An hour and 45 minutes until take off and still no movement on the trains. Things getting tense now. Dean is on manoeuvres, checking out of the Regus Express and marching purposefully through security. Oh no, looks like all three trains on the line are at a standstill. The boys are powerless. Will CtC be forced to travel with just three players? Still two hours until scheduled take-off (14:45) but this isn’t ideal. What’s this then? Unbelievable scenes… reports of a major incident on the line and all three trains carrying CtC team members come to a standstill. Right finally things are moving. Davidson it turns out has snuck into the airport via the VIP entrance and is leading a conference call from the BA gold club lounge. Gimson is first of the remainder on the train down to Gatwick, with Shaw and Rudkin not far behind. Hammond left home at 13.45, cutting it slightly fine perhaps, but he should be okay too. Right, welcome back to the live text coverage of CtC’s tour to Provence. I’m Matt Williams and I’ll be here to take you through the afternoon coverage. I’ve just been out for my lunch (Boots meal deal, if you’re asking – prawn mayo sandwich, orange juice and some salt and vinegar crisps). Still not much happening here, but expect things to pick up after lunch. Still nothing to see here. I’m going to take a break and I’ll catch you all back here later. Not much going on here. Dean and Fairbank make use of the excellent facilities at the Regus Express, enjoying the complimentary Nespresso and fruit. They inspect the showers (a bargain at just £15 extra) but decide against them, and simply sit back and enjoy being at the heart of the workspace revolution.